The folks at ReadyTalk, a web conferencing platform had their work cut out for them in marketing their brand against big names such as GoToMeeting, WebEx, and join.me. Not to mention, this bootstrapped company didn’t have a huge budget to grow off of. What they did have, though, were happy customers. That just doesn’t seem like good manners, does it? To get an inside look and better understanding of how ReadyTalk worked around the awkwardness of asking happy customers to say good things about their brand, I asked their Marketing and Communications Manager, Bo Bandy, a couple of questions. Bo gave some awesome insight in to what worked. Increase “marketing with customer” tactics such as guest blog posts, case studies, testimonials, etc. To achieve these goals, ReadyTalk first partnered with Influitive—a platform that focuses only on advocate marketing and serves as a hub for an entire advocate marketing strategy. ReadyTalk and Influitive worked together to develop and implement the Summit Club. Only customers who were considered “brand fans” were asked to join the Summit Club. Once a “happy person” (or brand advocate if you want to call it that instead) joined the club, they were given different challenges and ways to earn points. Points could be traded in for different rewards, incentivizing the customers to continue the word of the mouth recommendations and most importantly, establish a relationship that was mutually beneficial. What Makes an Advocate Anyway? An advocate for this project was defined as: A customer who had a non-financial investment in ReadyTalk but was happy with the brand. In general, an advocate is someone who is happy with your brand and willing to talk about it—many marketers just give it the fancy name. 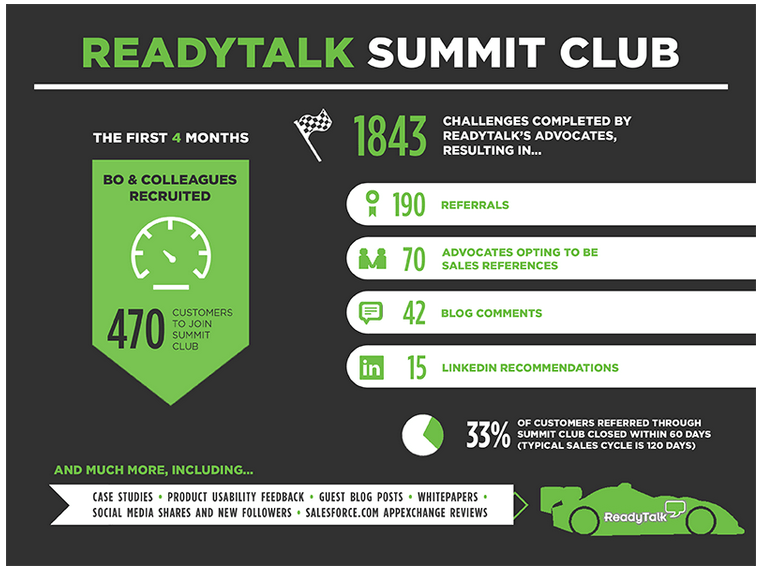 The product feedback that ReadyTalk gathered from their Summit Club members was an added bonus to their advocate marketing program. In just 4 months, ReadyTalk had a network of 470 opted-in brand advocates which led to 190 qualified referrals! These results were incredible for Bo and the team. It’s important to remember that not everyone is right for your advocate programs. Don’t invite just anyone who would want prizes to join. You only want to incentivize and work with people who are genuinely happy with your brand. These are the word of mouth recommendations that are sincere and authentic. The rest is just noise, and yes, insincerity can be picked up in tweets and blog posts. ReadyTalk won the BAMMIE Advocates Unite! award last year for their Summit Program implementation and results. Have you implemented any type of advocate marketing program or strategy in to your marketing toolbox? Please share in the comments! 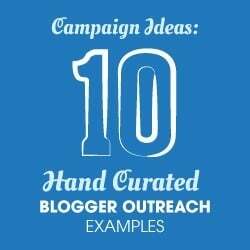 Do you have an awesome outreach marketing case study to share? I’m always looking to collaborate so email me at kristen@grouphigh.com!